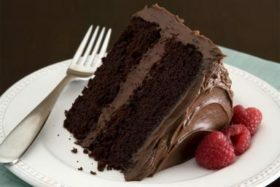 National Chocolate Cake Day is tomorrow, Jan. 27. Here’s a little history on how chocolate cake was discovered. Back in 1764, a doctor by the name of James Baker learned how to make chocolate by grinding cocoa beans between two massive circular millstones. Later in 1886, American cooks began to add chocolate into cake batter. This was considered to be the first chocolate cake to be made in the United States. A good way to celebrate National Chocolate Cake Day is to obviously eat chocolate cake that day. Here is a list of different kinds of chocolate cakes you can try baking or buy tomorrow.